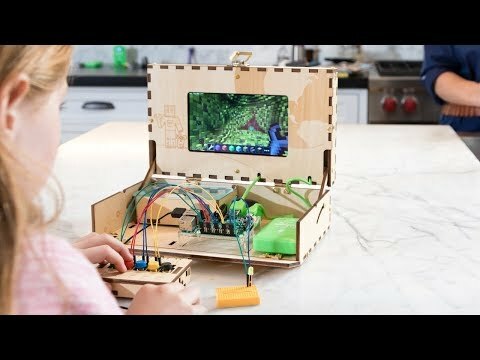 This Raspberry Pi kit for kids teaches early STEM skills, like coding and programming, through its own edition of Minecraft. After budding builders assemble their own computer, they take on increasingly complex challenges that merge learning with fun. Piper is a Raspberry Pi kit for kids that blends hands-on engineering with digital coding and programming skills in one accessible, fun package. First kids build the wooden computer, but that’s just the start of the educational fun. They then get to explore a Raspberry Pi Edition of Minecraft, tackling challenges that get increasingly more complex. They work their way up to building electronics with components included in the kit, like circuits, controllers, and programmable modules. Once they dominate all the levels of the game, kids can switch to creative mode to keep playing or explore the free downloadable content. Piper also gives kids access to an internet browser and a word processor, too. Putting Piper together should take an hour or two, but from there, the playing—and learning—possibilities are endless.